With a history of touring culturally significant 'World Music Acts' around Europe and Ireland since the early 90s, FeileAfrica is the first place to visit for anyone seeking interesting, unusual and exotic music, musicians, acts & artists, either international touring or Ireland-based. Our experience within this sector also means we are in a position to mentor & develop ex-pat and immigrant artists now based in Ireland. We see It as our mission to preserve artistic expression and the traditional forms of music from around the world before they disappear completely, no matter how far away from 'home' they are. 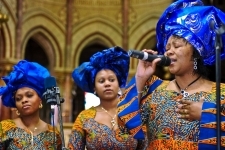 Artists supplied by us from Africa, The Caribbean, Latin America, Asia & Eastern Europe have performed at festivals and events throughout the world as well as private functions, parties, weddings & corporate events for over 20 years. Our knowledge and experience of touring 'World Music Artists' also make us popular as a resource for institutions and events looking for outside programming and assistance. For decades we have supplied acts, logistics, programming and co-ordination to awareness & fundraising events for hundreds of charitable institutions, from the largest multi national aid agencies & NGOs to small one-off projects like the ZWAAPV in Zimbabwe. And working with artists who have a recent & direct connection with their homelands means that some of their performance fee will frequently filter-down to their familes back home. Closely connected to the target audience through our 'club style' membership, via social media & newsletters, we can also help festivals & venues to market our acts more effectively and extend their audience outreach. Our decades of close personal relationships with individual artists, producers, composers & arrangers worldwide make us a popular choice for special one-off projects for TV, Radio, PR & Advertising productions, educational workshops and product launches. We always apply for as many funding opportunities as possible each year so that our acts can make tours and attend concerts, festivals & events with the least financial burden upon the artists or the promoter. This enables us to offer the best quality acts for the lowest possible fee whilst ensuring that the artists get paid the proper rate. Unfortunately we are not always successful with our funding applications, especially since the recession and competition from other applicants that has since ensued; the need for funding today has become even more necessary for the survival of the artists, the dissemination of their works and for the people that organise the events & maintain the venues. Supporting and touring music from four continents; we have supplied acts covering a multitude of genres, both culturally and musically since the early 90s. Sadly the technology to make inexpensive and easily-made videos has only caught-up with us in the last few years, otherwise our video channel would feature thousands of these performances and not just the 500 or so we have edited & uploaded over the last couple of years. It is, and was, my ambition to create a video channel with an enormous & diverse archive of music from around the world, much of it recorded here, on tour, in Ireland and available 24/7. Available on your laptop, phone or smart TV (like MTV except you select what you want to watch and when to watch it) a video Juke Box in your living room. In the last couple of years we have been able to include Irish trad gigs among the musical styles featured on our channel, a channel that is viewed from all over the world. A recent analysis of ‘views’ to this month's most popular video (recorded in Drogheda in 2013) showed that the country making the most views was USA at 22% with Ireland only making 0.5%, this was for an Ireland-based Nigerian act performing Nigerian Afrobeat music. Many artists that we toured here over the past 20 years have sadly since passed-away, so a return & repeat performance not possible and with no videos made of these performances they are now lost forever. 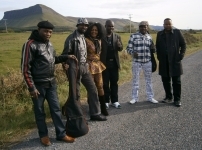 One of these acts, The Four Brothers from Zimbabwe played their last ever performance with lead singer/drummer Albert Ruwizhi in Kiltimagh, the remaining band members have all since passed away. We have recently been in touch with The New Four Brothers headed-up by the original band leader’s son (Marshall Munhumumwe jr) to try an organise a future visit to the UK and ireland, along with a European tour, which will, of course, be filmed. Our history means that many Ireland-based acts, often originating from foreign shores, will ask us to represent and market their performances and support them through the early years of putting their own stamp on the Irish music scene. I hope we will be able include your venue on their CVs. We have made it our task to video as many performances of our acts on tour as possible. We do this to help the bands raise their marketing profile and to catalogue their performances. We also aim to use this medium to assist promoters market their venues in a global as well as local sense, and of course to keep a record, an archive.